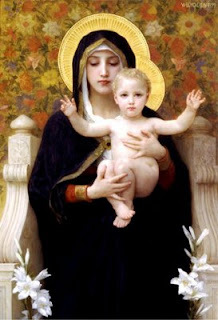 The Church has celebrated Mary’s birth since at least the sixth century. A September birth was chosen because the Eastern Church begins its Church year with September. The September 8th date helped determine the date for the feast of the Immaculate Conception on December 8 (nine months earlier). St. Augustine connects Mary’s birth with Jesus’ saving work. He tells the earth to rejoice and shine forth in the light of her birth. “She is the flower of the field from whom bloomed the precious lily of the valley. Through her birth the nature inherited from our first parents is changed.” The opening prayer at Mass speaks of the birth of Mary’s Son as the dawn of our salvation and asks for an increase of peace. We can see every human birth as a call for new hope in the world. The love of two human beings has joined with God in his creative work. The loving parents have shown hope in a world filled with struggles. The new child has the potential to be a channel of God’s love and peace to the world. Birthday celebrations bring happiness to family and friends. Next to the birth of Jesus, Mary’s birth offers the greatest possible happiness to the world. Each time we celebrate her birth we can confidently hope for an increase of peace in our hearts and in the world at large.